wherein a slope part (8) is formed between a back end (6A) of the arch (6) and a back end of the bottom of the shoe so as to side-to-side contact with the ground (hereinafter, referred to as the ‘constitution 4?. There are the descriptions: “Health Footwear, Snow Sports, Climbing Effect on Flatland ?Because of No Heel? “Idea based on Going up the Stairs to Strengthen the Lower Body? “Because there is no (back) heel, when a user wears the shoes, the lower body is get to be naturally stressed. When a user wearing the shoes walks or runs, (s)he has the effect like that (s)he climbs a mountain road at a 15 degree- slope. When an invention filed in an application is identical with an invention published prior to the date of filing the application, the filed invention is determined as having no novelty. 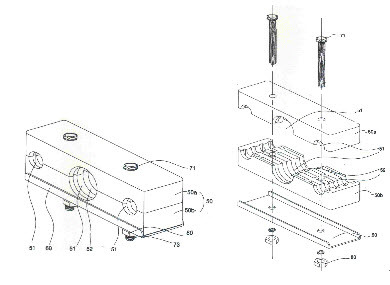 The question as to whether a patented invention is identical with an prior invention shall be determined based on whether the two inventions are identical with each other in terms of the technical constitution, considering the effects of the inventions. Even though the two inventions have differences in the technical constitution, if the differences are merely slight to the extent that they do not result in any new effects by adding, deleting, changing, or the like, the well-known and commonly-used art in the concrete means to solve problems, both inventions shall be considered as being identical with each other. (2) The invention described in claim 1 has the constitution in that an back bottom side of a sole of a shoe is removed to form an arch (6), when both ends of the arch (6) contact with the ground, the front bottom side (5) is formed to be upwardly lift at an angle from the ground, the sole is capable of back and forth pivoting on a front end (6B) of the arch (6), and a slope part (8) is formed between a back end (6A) of the arch (6) and a back end of the bottom of the shoe so as to side-to-side contact with the ground. Through the aforementioned constitution, a user of the shoes has the effects of easily and safely strengthening, stretching and balance-training the muscle of the lower body. Compared with the present patented invention, the cited invention relates to footwear in which heel is removed and which has the effect of climbing on a flatland. Therefore, the present invention described in claim 1 is different from the cited invention with respect to the technical constitution. Further, the difference(s) between the two inventions cannot be considered as being slight to the extent that they do not result in any new effects by adding, deleting, changing, or the like, the well-known and commonly-used art. Accordingly, the present invention described in claim is not considered as being identical with the cited invention. fixing units (80) connected to the lower parts of the connection shaft units (70) by screws and fixing the pipe receiving unit (50) and the support unit (60) to the railroad car body. The cited device is disclosed in the transaction specifications, details, inspection reports and manufacturing drawings regarding a double clamp and a cleat, which a company called “KAB?requested other companies called “EUL?and “BYOUNG?to manufacture the products on March 31, 2003 and September 9, 2002, respectively. This cited device does not have the reinforcing grooves or support unit included in the present registered device. According to Article 5 (1) of the Utility Model Law, when a device filed in a utility model application falls under devices publicly known or worked in the Republic of Korea or devices described in a publication distributed in the Republic of Korea or in a foreign country before the fling of the utility model application, the device cannot be registered as a utility model. In accordance with the above regulations, to argue that a device filed in a utility model application has no novelty, the filed device should be identical with prior devices publicly known, used or disclosed in a publication before the filing of the utility model application. Herein, “identity?means the substantial identity. Therefore, the identity is not limited to that the concerned devices are identical with each other, in terms of the technical idea described in the claims, the wording and formalities. If the concerned devices have a difference in non-essential matters which do not substantially influence the basic idea of the device, the identity of the concerned devices is acknowledged. Further, the identity of a device filed in an application and a prior device shall be determined, based on whether the technical constitution is the same in the two devices, considering the effects thereof. Even though the two devices have differences in the technical constitution, if the differences are merely slight to the extent that they do not result in any new effects by adding, deleting, changing or the like the well-known and commonly-used art in the concrete means to solve problems, both devices shall be considered as being identical with each other.